1. How long have you been sewing, and what got you interested in sewing/quilting? Were there other quilters/sewists in your family? I first started about 16 years ago, when I graduated from college. I wanted to have custom pillows, bedding, window treatments, etc. in my first apartment, but knew that sewing them myself would be much cheaper than having them made. So, I asked for a sewing machine from my grandmother as a graduation present, and pretty much taught myself. That lasted for about a year. 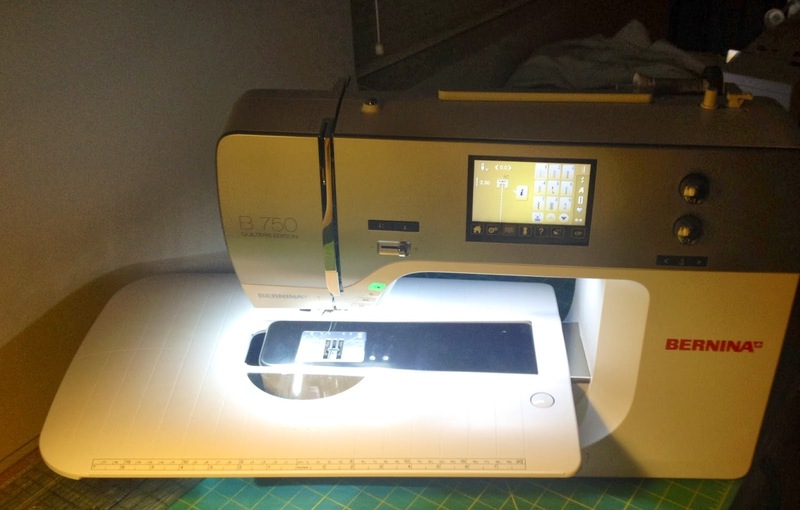 I then loaned my machine to a friend, who did much more sewing than I did at the time, and that was the end of sewing for me for a while. When I got married a few years ago, the same “itch” came back – to decorate my house. This time I decided it might be wise to take a few lessons, so I signed up for an Intro to Sewing class at what was, Whipstitch Sewing Lounge. It was there that I got excited about all the things I could create, as well as found a community to create with. My second class was an intro to Modern Quilting class. After that, I was hooked on quilting! As for sewing in my family, my mother owned a machine, but it was mainly for mending. I remember her making a couple of projects when I was young, but it wasn’t really a passion area for her. I grew up in a small town outside of Orlando, FL. Windermere is practically in Walt Disney World’s backyard. My father worked for Disney, so we spent a good bit of time out there. i had a really fun childhood and got to experience a lot. My family has moved from the Orlando area, but I still love going back to Disney and can’t wait to take my kids there someday. Which leads me to kids….My husband and I are expecting our first child (a baby boy) in April!! Since I live in the South, I have to be a college football fan, right? Well, I am. I attended the University of Florida and grew up as a Gator fan. I also have another Orange and Blue team that I cheer on, and not just because they are about to go to the BCS National Championship this January. My husband went to Auburn, and since that is a lot closer to Atlanta, I end up at more Auburn games these days, than Florida games. It kind of works out – they seem to recently have alternating “good” years, and do not play each other very often. We currently live in Atlanta, GA. I’ve been here for 16 years, and love it. 3. Why did you start Cuts of Cotton? I love fabric, especially the part where you get to put the colors, patterns and textures together. I have also always wanted to run my own business. These just seemed to fit together and I finally took the leap and started Cuts of Cotton in the Spring of 2013. 4. Where is Cuts of Cotton located? Is it an online and brick and mortar store? Cuts of Cotton is an “online store” only store, operated out of Atlanta, GA.
5. How did you come up with the name “Cuts of Cotton” for your blog/business? 6. What is Cut’s of Cotton’s specialty? 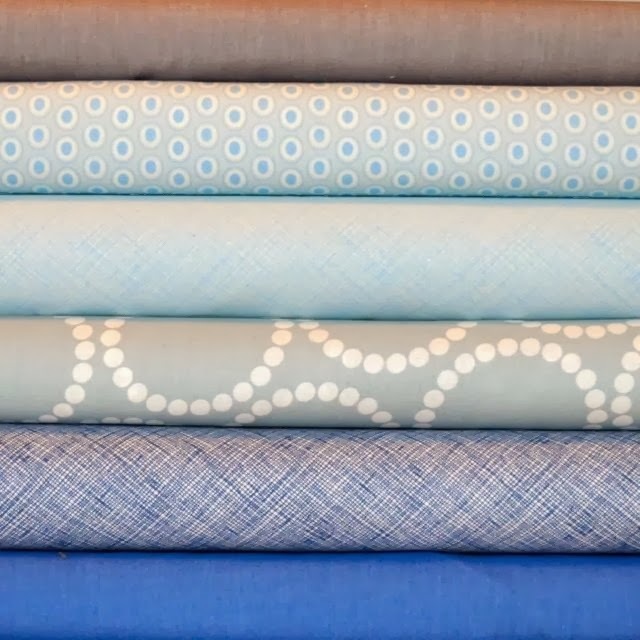 Cuts of Cotton specializes in stocking the basics: Solids, textured solids and basic patterned 100% cotton fabrics, with the exception of a few linens here and there. 7. 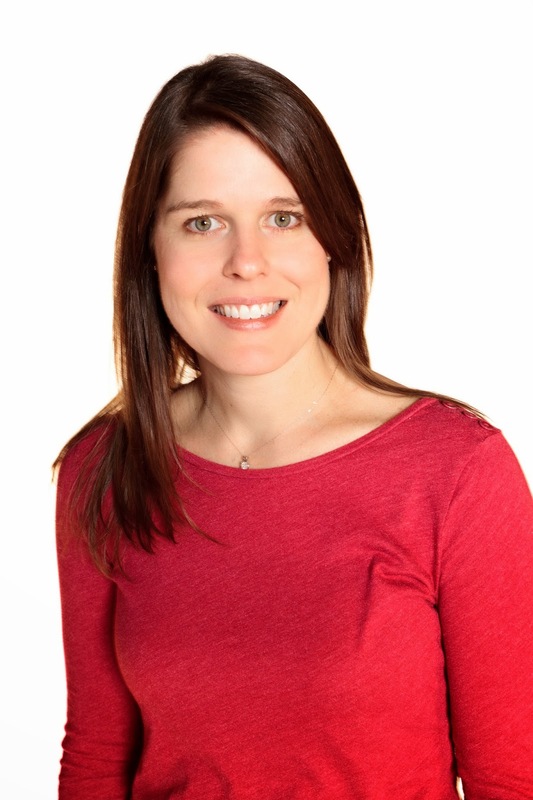 How do you see your business growing? I’d like to continue stocking fabrics in my focus categories and eventually be known as a one stop shop for all things basic. 8. Tell us about some of the favorite quilts you’ve made. 9. Tell us what designers, fabrics and colors inspire you and why? I have loved both of Carolyn Friedlander’s fabric lines, (Architextures and Botanics). I think my favorite thing about her lines are her color choices, and the texture in her prints. As far as favorite colors, I can be across the board. 10. What is your favorite and least favorite part of the quilting process? I love picking the fabrics and deciding on the quilt design. Thank you so much for taking the time to tell us about Cuts of Cotton, and sharing a bit about your life with our readers. In order to win this beautiful bundle of fabrics, please sign in to facebook and follow both www.cutsofcotton.com and www.hudsonvalleyquilts.com, and sign up to receive each of our blog posts. The Cuts of Cotton button is also on the left side of my blog. This offer ends at 5:00 PM on Friday, December 20th, and will be announced on Saturday and again on Monday. Please leave me your e-mail address so we know where to send the “January Blues” fabric bundle. Thank you again, Emily. And wishing everyone a Happy Holiday season. 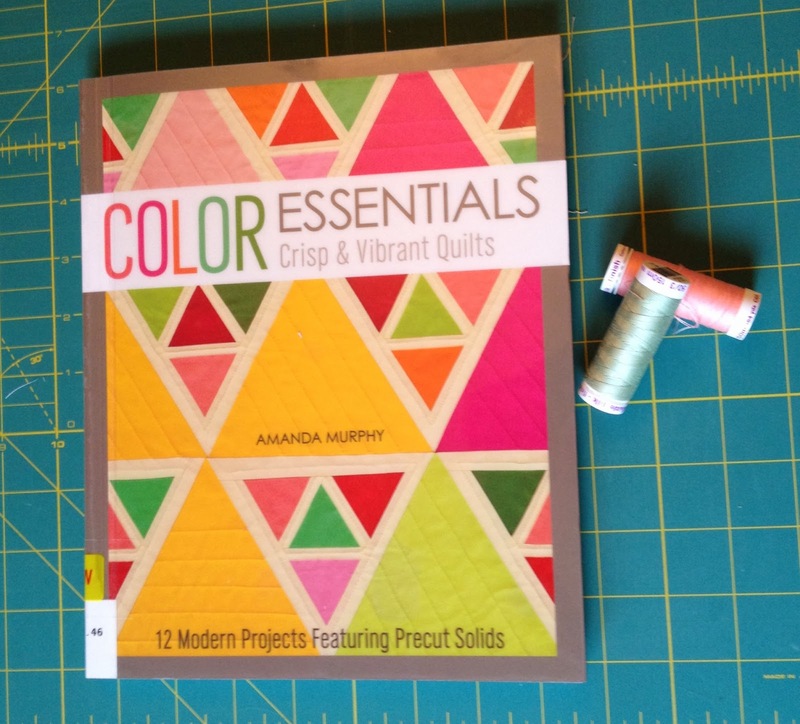 I just finished reading Amanda Murphy’s new book, Color Essentials; Crisp & Vibrant Quilts; 12 Modern Projects Featuring Precut Solids, published by Stash Books, http://www.amandamurphydesign.com/. 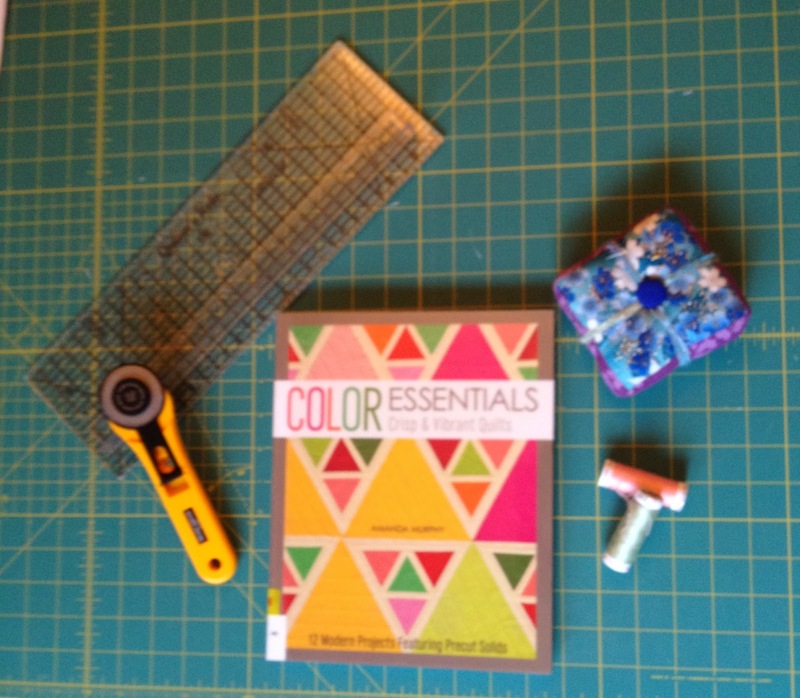 This impressive book offers quilters an easy to understand learning process about color. Many creative ways are illustrated when looking at the color wheel, and provide infinite options for making color choices for any quilt project. The book begins with Amanda presenting the color wheel with the equivalent Kona solids, and makes a smooth and sensible transition to color schemes by featuring photos of warm palettes, cool palettes, and analogues palettes. She then introduces the concept of a “poison color,” to the color schemes, to introduce the idea of movement, and how adding them, can make a quilt look more interesting. I never thought of it that way, and am “wowed” by this. I am looking at projects that I plan to make, in a whole new and exciting way. Then the reader is introduced to the Kona Sunrise Palette of 42 colors, which consist mostly of hot and warm shades, with a few cool hues. By adding some cooler green shades, it provides the palate with some great ways to create accents and pop to the project. Amanda also suggests 6 background shades that are great choices with this palette. Three other palettes are introduced following the same format as described above. They include; Kona Sunset Palette, Kona Bright Palette, and Kona Pastel Palette. I have to admit my vision and thinking is bubbling over with so many new ideas. We are then introduced to 8 more Robert Kaufman – Kona palettes that are fat quarter bundles. They tend to be a bit more analogous, and includes some neutral hues. All 12 of these bundles are offered for purchase as jelly rolls and charm packs, as well as fat quarter bundles. Twelve projects,with concise instructions, that are easy to follow are introduced. They are photographed beautifully, and show a quilter how they can make these projects,using their own color schemes. Of course the beauty of this is, it offers the reader confidence building skills by auditioning the palettes with the poison colors, and background suggestions. As I am auditioning with these new schemes, I am discovering unlimited possibilities. All twelve projects are nothing short of spectacular. My personal favorites are Lollipop, Iridescence, and Confetti. Other projects include, place mats, pillows and table runners. And an outstanding feature is that Amanda displays the projects finished in three other colors schemes. Two copies of the book are pictured above. The second one focuses on spools of green and pink thread. It’s not the thread that I’m trying to emphasize here. I learned something about adding pink and green fabric to projects that I never knew, and is very cool. This is a book that will become a permanent part of my quilting library. Thanks Amanda!! 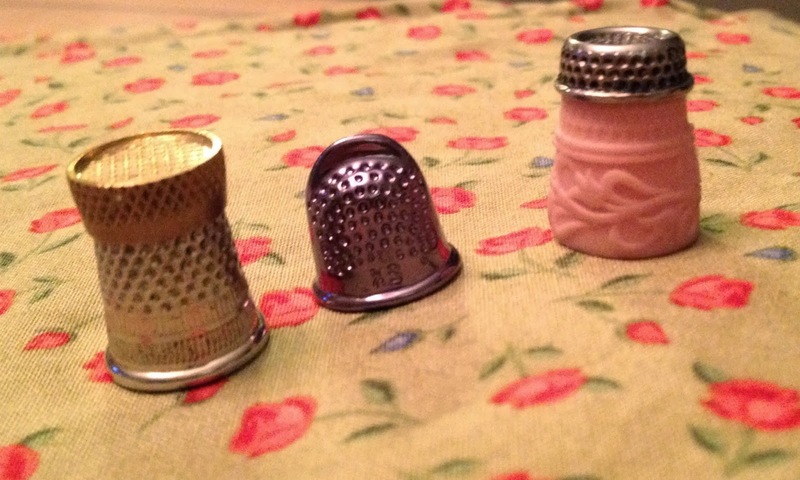 I received my holiday present early this year – Thank you!! 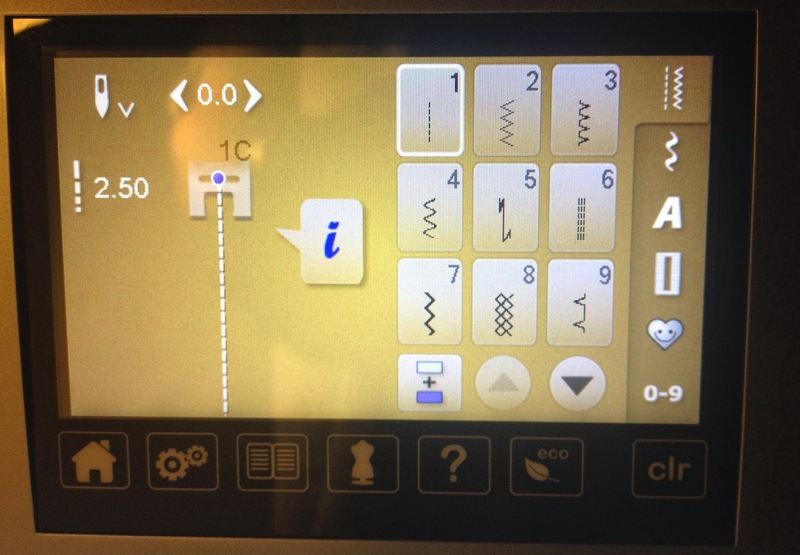 I am really excited, and have wanted to upgrade from my trusty Bernina 130 for a long time. I couldn’t wait to share. In this picture it looks like a little halo under the presser foot, which makes me laugh. Does that mean wonderful, beautiful quilts and other projects will happen here? I would have to wrap it in such a tight roll. With this new Bernina, I won’t have to. It has quite a menu to offer of stitches. It’s going to take me a while to learn it all. We quilters seem to love challenges. Below is the Bernina web site. Thank you so much for this wonderful gift!! Every so often I know of a brick and mortar store sale that is outstanding, and I will promote it. www.cottonpatchequiltshop.com is having “The 12 Days to Stuff Your Stocking,” sale. I love this sale, because I don’t live anywhere near Florida, and you don’t have to in order to benefit from this sale. During each of the 12 days, they feature a different product. Today there are a few different kinds of scissors. So if you’re interested, you place an order, and they hold it aside, and keep a “tab” for you, (with your credit card). Tomorrow, there will be a different product. You have the option of purchasing it, or not. At the end of the 12 days, the customer is charged for the products they chose, and then promptly all your purchases are sent to you. Orders over $200 receive free shipping!! Check out the web site for all the details. This is really worth it.